Everything that shines is GOLD, presenting Passport to Paris New Year's Day 01 January, 2017. Go for gold and step into Alumbra's gleaming wonderland sponsored by Moet & Chandon, hosted by Alumbra and the Soul Sessions crew for a memorable New Year's Day Party De Paris. Paris is always a good idea, and entertainment inspired by the blue white and red provides all party goers with a love for RnB, House, Urban, Soul, Rhythm, Blues & Reggae with tunes that will have you dancing all day in the Docklands. 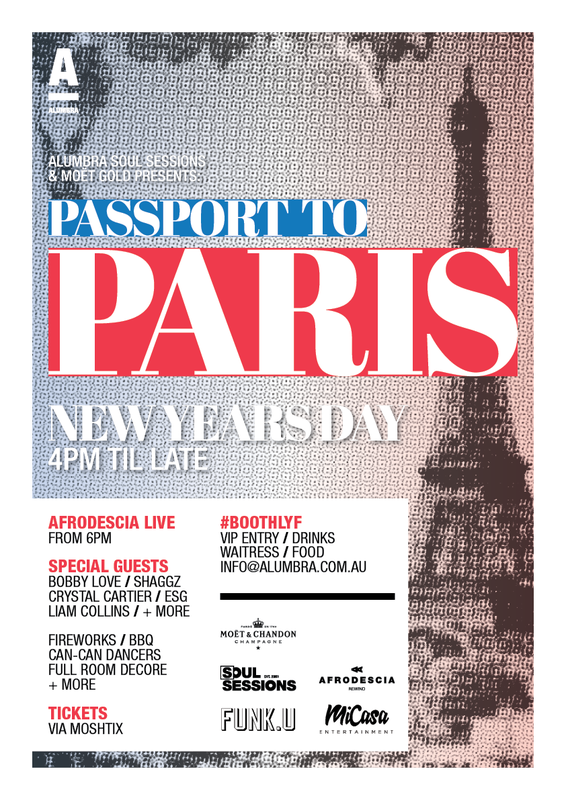 Alumbra fashions the 'Ooh La La' with Moulin Rouge Can Can Dancers, New Year's fireworks, Parisian decor and much more! Make sure your New Year resolution is one that will have you celebrating in the city of sunshine and champagne. From 4pm, Alumbra's kitchen & BBQ showcases a NYC street food menu by Chef Hat awarded chef Daniel Wilson (Huxtaburger). Download NYC Street Eats menu and enjoy a beer & a bite by the picturesque Victoria Harbour. Alumbra opens its doors with a past long line of international celebrity guests including Ciara, Mario, Kid Ink, Bow Wow, Usain Bolt, and much more! Afrodescia Rewind LIVE soul band will provide the old school vibes & smooth covers to the likes of Erykah Badu, Lauryn Hill, Jill Scott, D'Angelo, Anthony Hamilton and more. DJ tunes for the night spun by B-Love, Shags, Collins, Crystal Cartier, Justin Thomas and guests.